The annual Pelham Preservation & Garden Society fundraiser was held on Saturday, May 31, 2014, a fun evening of cocktails, hors d’oeuvres, and a silent auction to support our latest preservation projects. As in past years, the event was be held at an historic Pelham house, this year at the home of Katy and Nick Loria. Residents of the Pelhams have long appreciated the architecture of this lovely Tudor style home as well as its lush gardens and were able to enjoy a peek at the interior of this magnificent home. America's architecture has been influenced, like most of our culture, by Great Britain. After a strong influence from France during the reign of Napoleon III in the late 1800s, by the turn of the century England had resumed its strong influence on and connections to America with many of the nouveau riche of the United States marrying into English nobility to save their great estates. 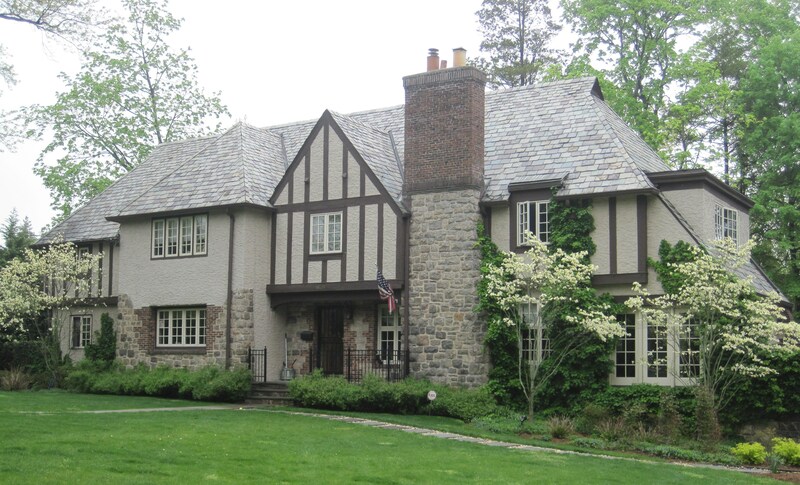 As a result, by the 1920s, American Architecture had fully embraced and revived England’s “Tudor Style.” Fueled by the wealth made in the stock market, the style was dubbed “Stockbroker Tudor. Pelham lays claim to many homes in this Tudor style, but a standout is the home of Katy and Nick Loria at 1424 Park Lane. Built in 1928, the Loria’s home was designed in this style as demonstrated by its asymmetrical desgin, stucco and half-timbered facade, slate roof and prominent chimney. It boasts an enviable level property and impressive gardens on almost an acre of land. The home has an interesting history. It was long the home of Judge Vincent L. Broderick who was a senior judge of the Federal District Court for the Southern District of New York and served as New York City Police Commissioner appointed by Mayor Robert F. Wagner in May 1965. Judge Broderick led the police force through the blackout that blanketed the Northeast, through the biggest transit strike in the city’s history and the first visit by a Pope, Paul VI. His family, wife Sally and six children lived here until 2002, when it was purchased by the Lorias who are now enjoying it with their nine-year old twins.